The Arctic and the Northern Hemisphere surprise experts with impressive snow and ice gains, decade-long stability. Reader David at Facebook brought my attention to the fact that Greenland this year has in fact been increasing in ice mass. Overall, however, reduced melting and heavy early springtime snowfall may result in a net increase in Greenland’s ice mass this year for the first time this century. 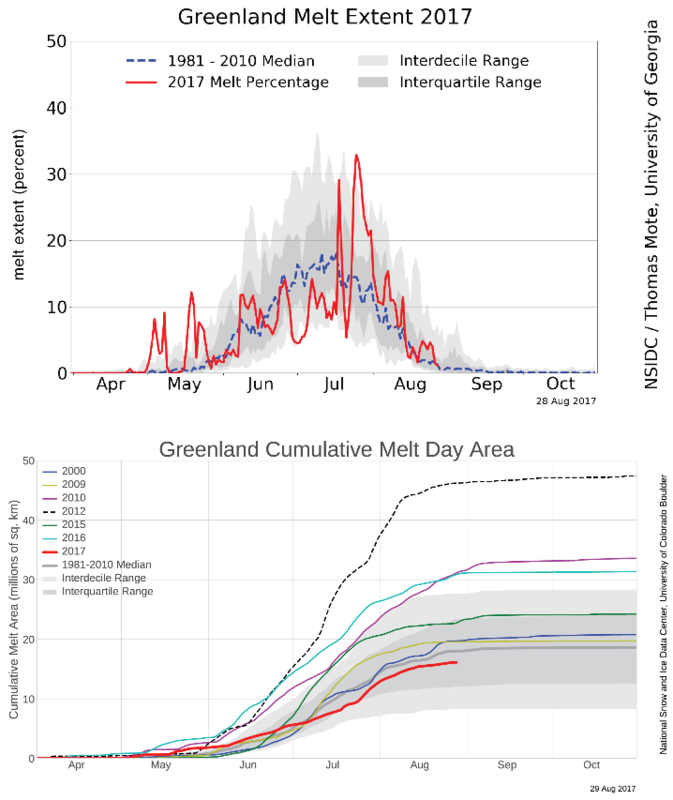 Greenland’s ice melt this season has been well below normal, the NSIDC reports, and may end up seeing a net increase this year for the first time this century. Chart: NSIDC. Meanwhile the University of Rutgers reports that Northern Hemisphere snow extent in August, 2017, was above normal at 2.915 million square kilometers, some 118,000 square kilometers above the mean. Arctic sea ice, unquestionably in decline since satellite measurements began in 1979 – which was a peak period for sea ice cover – has shown surprising stability over the past 10 years despite all the claims “the Arctic is melting rapidly“. Arctic sea ice extent stable since 2007. Source NSIDC. Chart courtesy of Ice Age Now. Just as we discussed the situation on Greenland above, the sea ice surrounding the Danish island has been extraordinarily high this year, thus extending a stable ice extent plateau of the past 17 years. It’s no surprise that the ever more desperate climate alarmists have decided to chase hurricanes this year. The Arctic is not cooperating with the warming, “death spiral” scenarios any longer. has shown surprising stability over the past 10 years despite all the claims “the Arctic is melting rapidly“. Only a skeptic could have made that observation 😉 … for the fun of it: http://imgur.com/a/8xh8C (oh no, the rapid decrease between 1996 and 2012 should make us worry!). Haven’t you wrote in the hurricane post “Expect global warming alarmists to seize on the final damage tally, no matter what it turns out to be” ? Shouldn’t skeptics equally refrain from performing victory dances when slightly less “bad news” comes from the Arctic/Greenland? Oh, and wasn’t it a hurricane that caused the high SMB this season? https://www.carbonbrief.org/guest-post-greenland-ice-sheet-2017 … so why should we not look at hurricanes and their influence on increasing snow in Greenland? The last graph schouldn’t be used because of this notice at the website of “The Cryosphere Today”. There is not info for the “Ice Age Now” Arctic ice chart that shows ice growth. Other sources are not so clearly going up. So the question is, What is he (Robert W. Felix) presenting? While these do not show the “upward” bend, they do suggest that the minimum is near and will be greater or about the same as the last 4 years. Don’t cause confusion with facts. While it’s good to know the science, it also helps to know human nature. In fact, armed with only the latter, we can be pretty certain the warmists are lying. That, and if they HAD the science, they would be revealing it with crystal clarity. They are not. Because they cannot. What’s so good about ice? Global warming is something to dream of and aspire to, not something to fear, and in particular, this nonsense about less ice being anything but good, defies all logic. Stop it. You’re just playing the game the way the warmists want you to. gnome 11: I too have waited all my life for global warming. Unlikely there was anyone more disappointed than myself when I found out that it was all a mean-spirited hoax. This statement is incorrect since we have continuous sea ice satellite data from 1973. It shows the sea ice charts for both polar regions from 1973-1990. 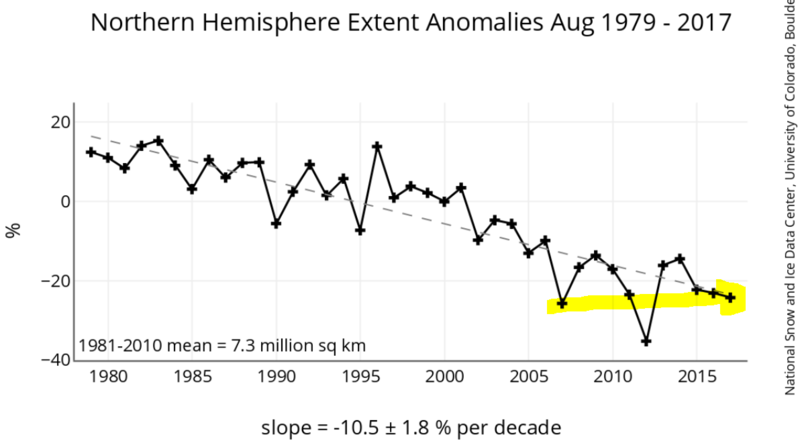 The NOAA in 1990,still accepted the earlier sea ice data. Be especially careful referencing “Ice Age Now” as they are very careless with their work, often making false (apparently unchecked) statements. Look at their list of expanding glaciers as just one example. Just recently there was excitement from the alarmists that two yachts become first ever vessels to enter Central Arctic Ocean without icebreaker support reaching a latitude of more than 80 degrees north. Obviously tying to prove that man made global warming was the cause. If the globe is continuing to warm as IPCC climate models insist, why has Arctic ice extent remained essentially static for ten-plus years? Why has Antarctic sea ice grown over the same period? Could it be that the computers don’t know their bits from their bytes?